Hello friend 🙂 I hope your weekend is going well. With a newborn at home, my days and nights are starting to blur these days. I constantly look at my phone to check what day/date it is. I have a new appreciation for time management these days, since I normally operate on 2-3 hour blocks. Since the hubby has gone back to work, me and Hawke are spending most of our days with just the two of us. I try to make plans to leave the house every few days so we can get some fresh air. I try to make plans to meet up with friends when the weather is beautiful and last Friday was gorgeous. 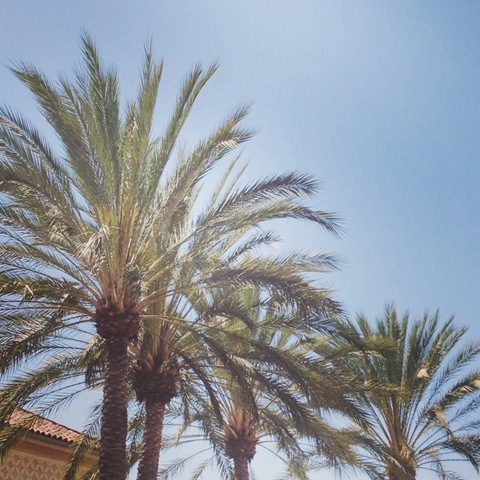 Hot and breezy! 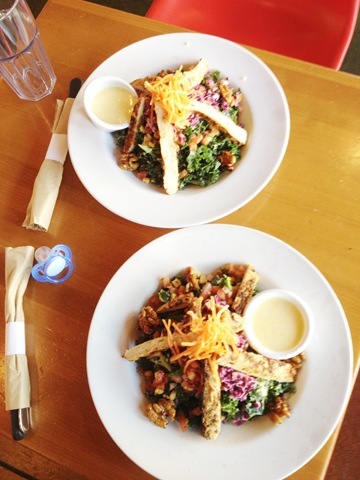 We headed south of OC for lunch at Veggie Grill. 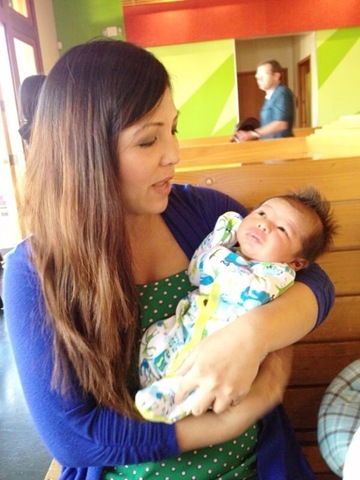 I met up with Sarah for lunch, so she can meet the baby for the first time. Look at that kale goodness! So delicious and so good for you. If you’ve never had kale, this would be a great salad to try. I think it will make you change your mind about kale or healthy food in general. Hawke loves riding in the car so he slept thru the whole ride and also while we were eating so Sarah and I were able to catch up. After Hawke woke up, it was time for pass-the-baby-around game. We had a great lunch date. Sarah had to go back to work and I put Hawke in the Ergo carrier and we did some shopping for me. I bought a few sale items at Old Navy. 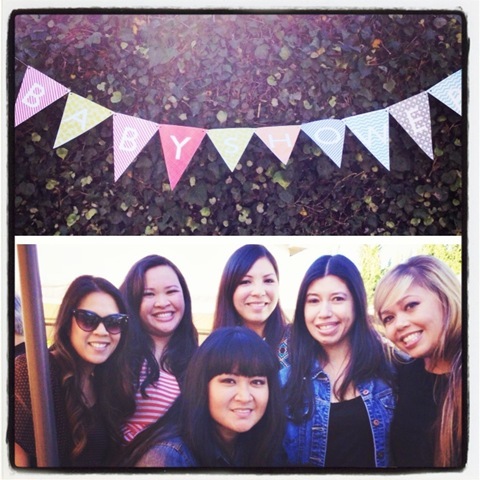 Earlier this week, I celebrated my friend Stefanie’s baby shower. The hubby had the day off and he stayed home with the baby for a few hours so I can have some girls time. (P.S. after my baby shower, I gave Stefanie the DIY decorations we made so it can be put to use again, including the baby shower sign below.) I’m still loving that sign and how colorful it is. Too bad we don’t know of anyone else to pass it on to. Stef chose not to find out the gender of the baby (she’s due at the end of the month), so it’s going to be a surprise. 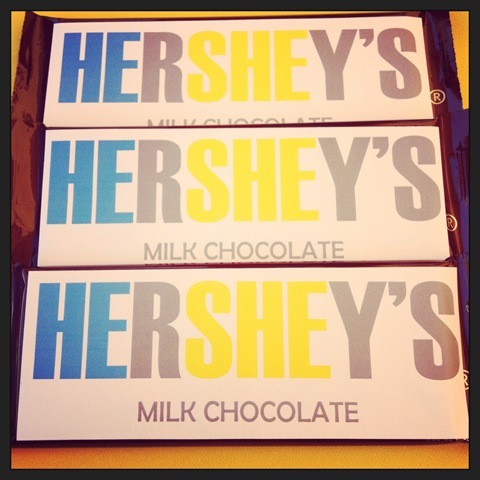 How fun are these chocolate bars she gave away? HE or SHE? That salad does look good! Your baby with his spiky hair is adorable! YUMMY salad! Glad you’re getting out a bit. No one can prepare you for what those first couple months are like! I swear, once you hit month three..things just get easier and easier until they walk ;). He is just so so cute. 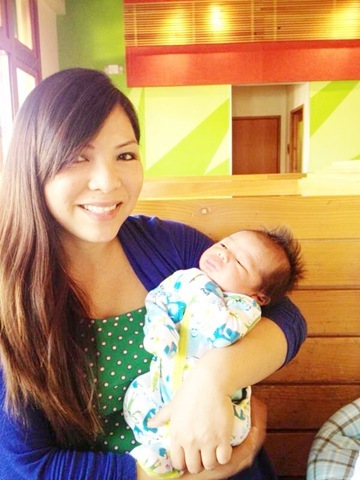 What a Cutie Pie – thanks for sharing your little man:) Congrats – Have a Great Day! It will take some time to get into a routine and get used to being home alone with him but it will happen. Honestly the first three months are the hardest but after that things get easier. I promise!